Donna had her foal last night! Yesterday evening I took some photos of her udder to put on my last thread, but I thought she might foal last night so I put her in the yards and went up in my pajamas sometime in the middle of the night and she had had it. So she beat me on the update photos. She had a lovely healthy filly who is bay going grey. The stallion is grey and has sired 5 foals including this one and so far they all appear to be going grey, some born that way, others taking longer. She was spot on time with my estimated foaling date, I had anticipated a few days after the 31st Jan and that is what I got. I think the foal looks like mum, in her general shape and the shape of her head. I think she might have been waiting as I had to have 40 head of cattle in the paddock waiting for sale and I just got those out the night before. Last night I noticed she had got rid of her sister and gone off by herself and had waxed up so I figured she was likely to be due any time. I don't have to worry about water in the dams as it has not rained for 3 months ( hence why the cattle were being sent off) and the dams are just about empty. Donna foaled in the yards overnight and the foal was doing well. I locked her away from her sister to foal which was good because Sally got very agitated and interested in the foal. I have removed Sally to another paddock and let Donna and the foal out into the big 80 acre paddock in the morning as we are having severe heat waves here and they have to get shelter. Donna seems a bit agitated, like she wants to hide the foal away. She has been hiding in odd places in the paddock, and then running off with the foal in tow. It might be that she wants to keep it away from other horses and predators, and perhaps me also. She lets me come up to her and give her some feed and a pat but then goes off rather than hang around for a cuddle like she usually does. Is it normal for new dams to be anxious? She just seems to have generalised anxiety but is looking after the foal very well. I am just wondering if she is running it about more than is ideal? The next two days are going to be cool so I can lock them up again and handle the foal and check Donna is OK but then it is back to heatwave so I will have to let them out during the day at least. Yup, I know photos are compulsory with new foals - the little filly is not very photogenic yet - There is too much contrast and sun and she is always underneath mum. I put the photos in photobucket so if this link does not work let me know and I will try to fix it. I know this is not the best post but I have been mustering and preparing for sale 43 head of cattle including 8 bulls from all over the property in a heat wave so excuse the rather bitsy journalism this evening. beautiful! I wonder if Mum is nervous because she needs to be with other horses but also nervous to have the baby with others? can you get her beside her sister but not allow the sister to be in with the baby? I had a mare that we let foal in the field for the first time. She had 2 previous foals in a stall. Well, that year that she foaled in the field she kept the baby away from us after the first day, for about a week. She wouldn't even come in for grain. We could get so close just to see that everything was ok but then she would take off. After that week though she calmed down and wanted her feed and would come in for it and after that it was just fine. But it was nerve wracking trying to get close to her and the baby. The baby was fine running around with mom. Awww, she's a cutie. I love baby pictures! Do you have telephoto feature on your camera? Then you get good pix without having to get too close. As Kim said, give momma a week or so, and she'll be much better with you around. More pictures of your pretty baby!!! From my experience, I would get my hands on the mare and foal right away. Don't want the foal to think: humans RUN! I have seen that on many occasions, and the foal seems to think that forever for its life. JME. Beautiful filly! Beautiful momma too! Good that you can keep them up at least a little while--the right kind of hands on in early life is good for futures. Yes, it is completely normal behavior. Your mare is in maternal-hormones-overload and will be for several more days. They usually start to mellow out around the time of foal heat. It's more pronounced when the mare has lots of room to keep between her foal and every other living creature. Still, she might actually like the presence of her mare friend, even though she will make her keep a distance for a while. She'll like that it's not just her against all other predators. In a few days, she won't be as protective and may even bring the foal around to make introductions. This over-protectiveness can be somewhat avoided by keeping the mare and foal in close quarters (like a big stall) for a few days immediately after foaling, and spending a lot of time in their presence. This usually tempers the foal's prey instincts somewhat and give the mare time to settle down and feel safe. But it sounds like you're doing your best for them by letting them go where they can find some cool shade. Congratulations on a healthy foal! "If you only knew what your horses thought of you!" So cute. 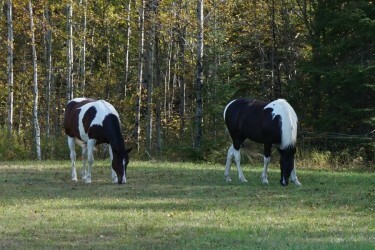 I miss having foals around here, can not convince hubby a foal would be a good idea. Proud mom to Sydney, saddlebred, Birch, TWH, and Abel, SSH. Oh is she a cutie! Momma has that 'stop looking at her' glare! For continuity I will update here, as well as the other new foal that came yesterday. So still on the hunt for a name, cause I am hopeless at it. This filly is 7 months old new, and fuzzy in her winter coat. She is pretty good and leads quite well, and is very very good with her feet. She needs a bit more work on tying up when I get her in the yards. I think I will wean her soon when I bring the gelding to start riding for the spring. She looks very healthy in herself. She is like her mum in that she likes to be the centre of attention. (Mothers Registered name is Shes a Primmadonna, and she is). Mum was getting her teeth done by the horse dentist. That took a bit too much attention away from yours truly so she stuck both front feet in the middle of proceedings. I had to catch her and give her attention to let the dentist get on with it. She is going grey very quickly. I am terrible with names....just enjoying the pictures!